Shape 50 is the versatile monitoring loudspeaker par excellence. This monitor can be used from 30″ away (80cm), and it has very extended low end frequency response (50Hz) considering its compact design. Thanks to this design and to the numerous settings, this monitor is ideal for rooms measuring less than 130ft2 (12m2). The three monitors are all made in France and integrate five innovations to maximise acoustic transparency. Designed to meet the needs of nearfield monitoring, Shape monitors combine an ingenuous design and numerous settings optimised for the acoustics of small listening rooms. These innovations provide remarkable acoustic transparency. These new work tools distinguish themselves through the wide and extremely precise stereo image. The bass register is articulated and controlled. The lower mid-range and mid-range benefit from extreme neutrality, and without any masking effects, making equalisation of these essential registers much easier. Finally, the new tweeter is what’s at the source of the very high definition. It efficiently reveals any hissing, and it’s also very precise in the very high end. 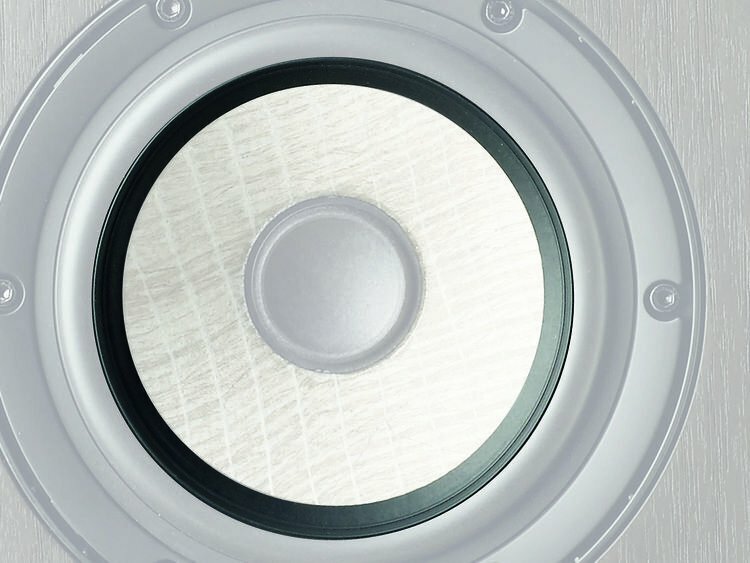 Focal first introduced their glass-fiber speaker cones in their SM series, where the extraordinary definition provided by their lightweight rigidity made them an instant hit among professional mix engineers. Focal's Shape series takes this speaker design one step further by introducing a layer of flax fiber, which is significantly more rigid and twice as light as glass fiber. They sandwiched this flax layer between layers of glass fiber, resulting in a piston-like low-frequency action and increased dampening. 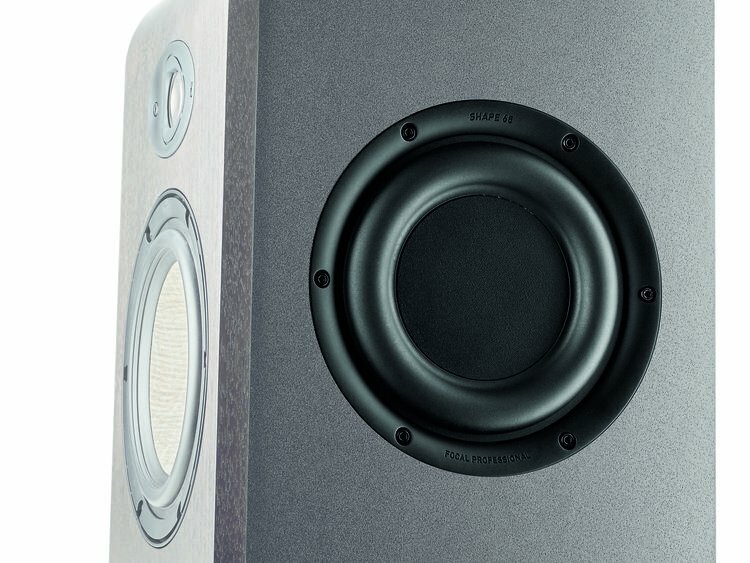 You'll be astonished by the low-frequency accuracy and midrange clarity these speakers offer. You couldn't ask for better compact nearfield monitors when it comes to critical mixing applications. The Shape series introduces another major design upgrade to Focal's nearfield monitor technology by reimagining their already impressive aluminum-magnesium dome tweeter. For starters, the M shape itself provides increased rigidity, which offers many of the same advantages as the increased rigidity of their flax fiber cones: greater definition with lower distortion. The M-shaped dome works with its own dedicated TMD surround for an impressively linear response below 6kHz. This horn also comes outfitted with housing that provides equal horizontal and vertical directivity, and a less-directional profile overall. 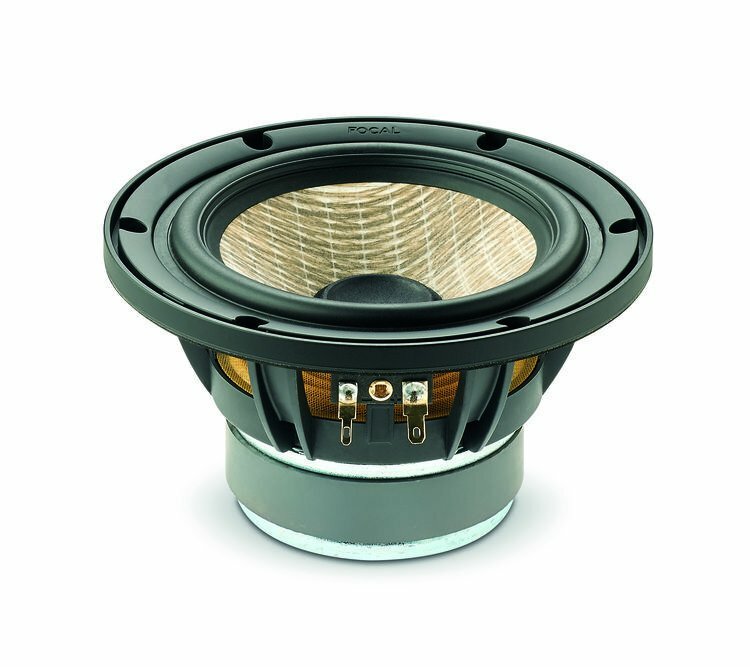 Finally, the magnetic component, which features a Kapton former in the voice coil, offers a lower high-frequency distortion than Focal has previously achieved in an affordable nearfield monitor. 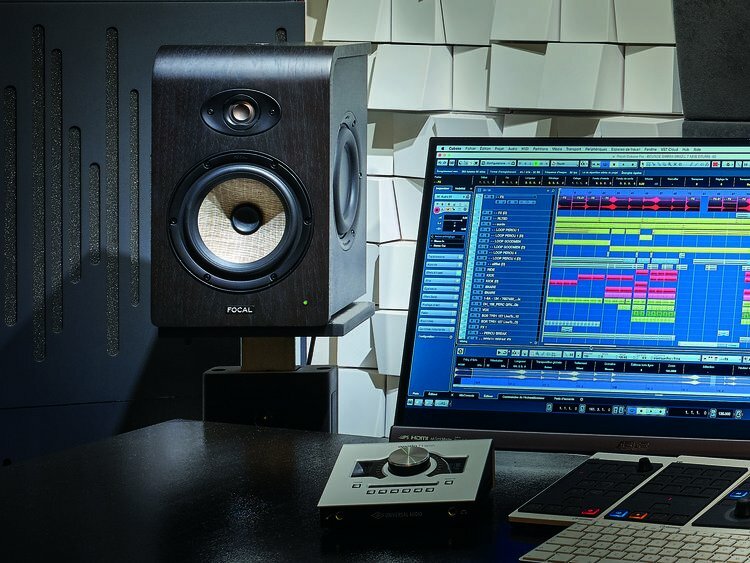 Beneath the elegant walnut veneer and meticulously calculated MDF enclosure, each Shape series studio monitor features a number of technologies that give them uniquely linear frequency responses. One of these is the TMD surround ringing either speaker. Strangely enough, this stabilization element comes from special architecture found at the top of skyscrapers such as Taipei 101. These suspended harmonic absorbers promote a more piston-like action that targets specific frequencies. In the Shape series, these surrounds produce a remarkably flat frequency response around 1kHz–2kHz, resulting in astonishing neutrality with virtually no measurable distortion. One of the technologies Focal popularized in their previous generation upper-end monitors was the use of passive radiators. Just as they did in the SM series, these passive radiators provide the Shape series reference monitors with an extended low-frequency response that goes far beyond what the seasoned studio engineers at Sweetwater expect from modest-sized nearfields. By balancing low-frequency harmonics with the dual surrounds highlighted above, these passive radiators accomplish what ports simply can't, providing you with low-frequency tuning that extends bass clarity and allows you to position your monitors closer to walls, without compromising accuracy. 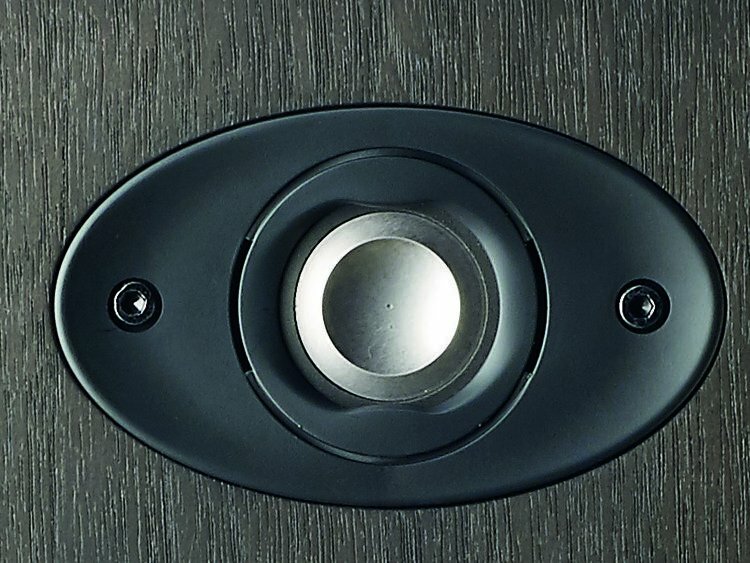 This detail makes them an ideal choice for small studios and editing suites. 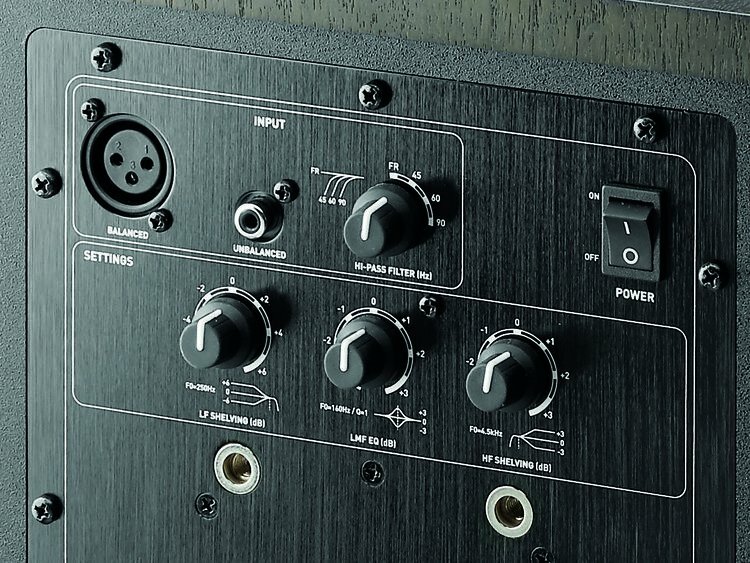 It's impossible to overstate how important a role the amplifier plays in the function of precision reference monitors such as Focal's Shape series, both in terms of pairing the appropriate electronics with the acoustic elements and in providing you with the flexibility needed to tailor the sound to your control room. Regardless of other settings, Shape series studio monitors provide a stable tonal balance at any volume, a key element in creating mixes that translate well outside the studio. At the same time, you can easily adjust your Shape studio monitors to your room, thanks to the tunable shelving filters and 160Hz crossover slope. There's also an adjustable highpass filter onboard, so you can cut out serious low-frequency problems or accommodate specific subwoofer setups.